A heuristic is a word from the Greek meaning "to discover." It is an approach to problem solving that takes one's personal experience into account. "Consistency heuristic" is a heuristic where a person responds to a situation in way that allows them to remain consistent. "Educated guess" is a heuristic that allows a person to reach a conclusion without exhaustive research. With an educated guess a person considers what they have observed in the past, and applies that history to a situation where a more definite answer has not yet been decided. "Absurdity heuristic" is an approach to a situation that is very atypical and unlikely - in other words, a situation that is absurd. This particular heuristic is applied when a claim or a belief seems silly, or seems to defy common sense. "Common sense" is a heuristic that is applied to a problem based on an individual's observation of a situation. It is a practical and prudent approach that is applied to a decision where the right and wrong answers seems relatively clear cut. "Contagion heuristic" causes an individual to avoid something that is thought to be bad or contaminated. For example, when eggs are recalled due to a salmonella outbreak, someone might apply this simple solution and decide to avoid eggs altogether to prevent sickness. "Availability heuristic" allows a person to judge a situation on the basis of the examples of similar situations that come to mind, allowing a person to extrapolate to the situation in which they find themselves. "Working backward" allows a person to solve a problem by assuming that they have already solved it, and working backward in their minds to see how such a solution might have been reached. 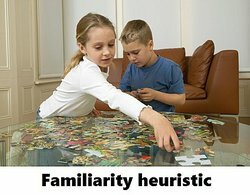 "Familiarity heuristic" allows someone to approach an issue or problem based on the fact that the situation is one with which the individual is familiar, and so one should act the same way they acted in the same situation before. "Scarcity heuristic" is used when a particular object becomes rare or scarce. This approach suggests that if something is scarce, then it is more desirable to obtain. "Rule of thumb" applies a broad approach to problem solving. It is a simple heuristic that allows an individual to make an approximation without having to do exhaustive research. "Affect heuristic" is when you make a snap judgment based on a quick impression. This heuristic views a situation quickly and decides without further research whether a thing is good or bad. Naturally, this heuristic can be both helpful and hurtful when applied in the wrong situation. "Authority heuristic" occurs when someone believes the opinion of a person of authority on a subject just because the individual is an authority figure. People apply this heuristic all the time in matters such as science, politics, and education. By reviewing these heuristic examples you can get an overview of the various techniques of problem solving and gain an understanding of how to use them when you need to solve a problem in the future. "Examples of Heuristics." YourDictionary, n.d. Web. 23 April 2019. <https://examples.yourdictionary.com/examples-of-heuristics.html>.